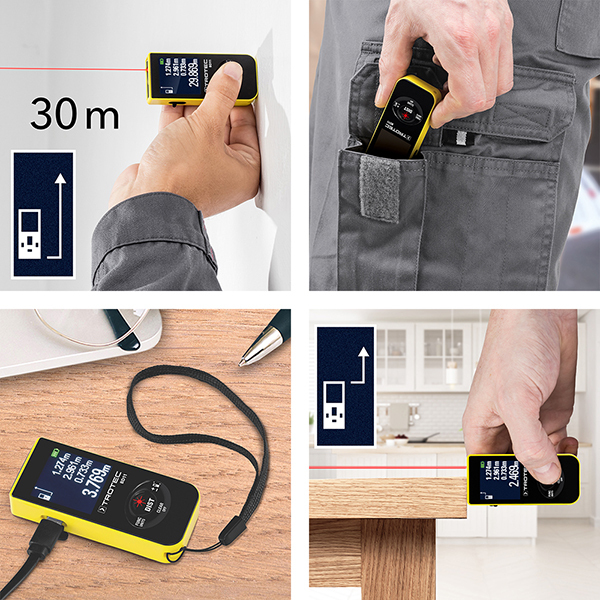 Despite its small size, the convenient mini laser measuring device BD11 comes equipped with everything a distance meter might need. These features includes the precise laser measurement of distances, areas and volumes, the surprisingly varied equipment with helpful functions as well as the simple, intuitive operation. At the same time the measuring device is compact enough to fit into a trouser or shirt pocket. Finally, a distance meter saving the avid do-it-yourselfer or craftsman both effort and money. The laser measuring device with its unbeatable value-for-money ratio determines distances of up to 30 metres, areas and volumes precisely and with lightning speed. And that with a maximum discrepancy of no more than 3 millimetres! Moreover, the BD11 can score with the functions ‘Pythagoras’ and ‘Pythagoras times two’: Both are indispensable functions enabling the indirect calculation of distances or heights in addition to checking the right angle. The hand-held laser meter further comes with handy features such as a non-stop measuring mode, the addition and subtraction of the measurement results as well as the automatic saving of the 10 most recent measurements. The simple operator guidance and practice-optimized equipment of the hand-held laser meter have their share in how great the small measuring device actually is. What is more, there is an automatic switch-off function after 30 seconds for the laser and after 3 minutes with regard to the entire measuring instrument which is encased by a robust, dust- and splash-proof housing according to the IP54 type of protection. The integrated lithium-ion battery can be recharged quickly and easily using the micro USB cable included in the scope of delivery. In short, the BD11 certainly is a practical and compact aid for distance, area and volume measurement operations. Using the BD11 with its 3-point Pythagoras functions you can carry out indirect calculations of distances, heights or partial heights. High performance maintaining a low profile: Take the laser distance measuring device BD11 with you wherever you go.